Colored inversion is a robust seismic reservoir characterisation tool, which provides band limited impedance data from seismic reflectivities (Lancaster and Whitcombe, 2000). The main part of the process is the color operator design. 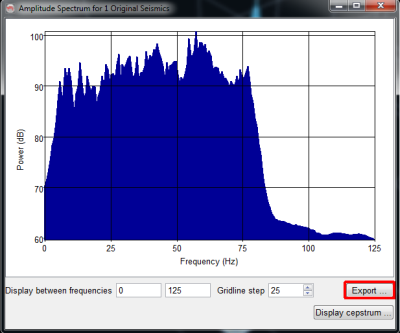 This simple utility can do this task using amplitude spectrums exported from OpendTect. The application is coded in Lazarus using FPC and FFT code of Alglib, and the used icons were modified from FatCow Farm Fresh Icons. 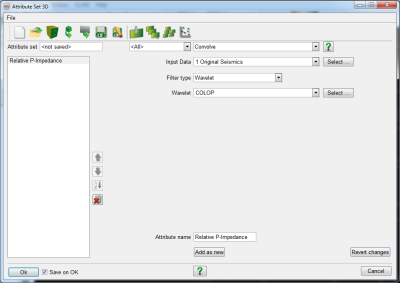 Source files of COLOP project are available for download to build the app on other platforms like OSX or Linux. Concept and prototype can be found as an IPython Notebook in the filelist, or here. 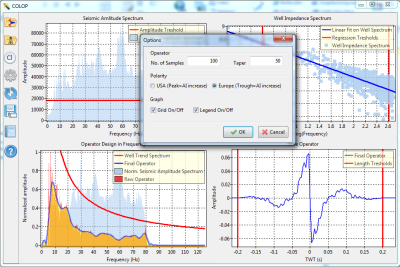 The aim of this technique is to find an operator which can transform the seismic amplitude spectrum to match the Earth's impedance spectrum. The main part of the process is the color operator design. 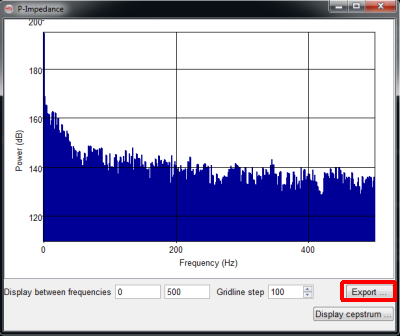 COLOP can do this task using amplitude spectrums exported from OpendTect. COLOP can work in three modes. Colored inversion mode (CI), spectral blueing mode (SB), and spectral whitening (SW) mode. In the case of CI mode, operator has -90 degree phase spectrum. In the case of SB mode, operator is calculated from AR(f), which can be defined by following equation: AR(f)=cfß; ß=alfa+1; and the operator has zero phase spectrum. 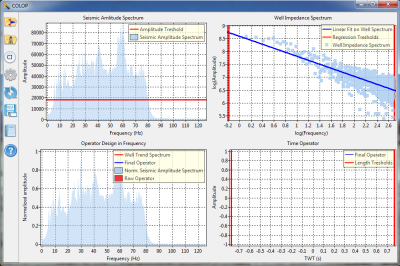 In SW mode flat (white) target spectrum is the basic assumption. Lancaster, S. and D. Whitcombe, 2000, Fast-track ‘coloured’ inversion: SEG Expanded Abstracts, 19, 1298-1301. Blache-Fraser, G., and J. Neep, 2004, Increasing seismic resolution using spectral blueing and colored inversion: Cannonball field, Trinidad: SEG Expanded Abstracts, 23, 1794-1797. Neep, J. P., 2007, Time variant coloured inversion and spectral blueing: 69th EAGE Annual Meeting, Extended Abstracts, B009. 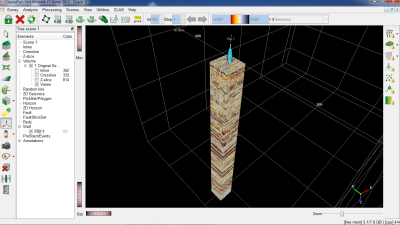 This tutorial demonstrate a workflow based on the public F3 dataset which can be downloaded from the Open Seismic Repository. 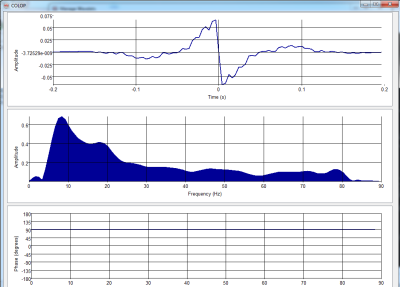 Generate P-Impedance log amplitude spectrum and export it. 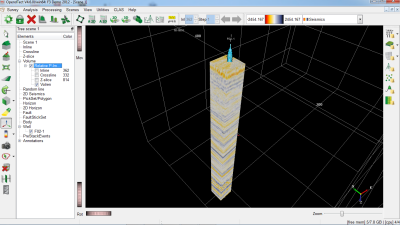 Visualize seismic data using volume rendering at the neighbourhood of the well. 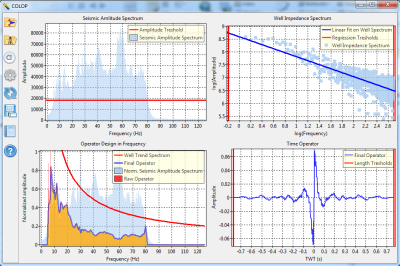 Generate amplitude spectrum of visualized seismic, export it. 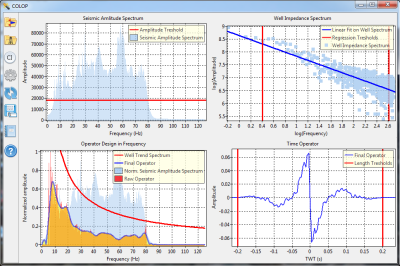 Start COLOP, load seismic and well spectrums.